How To Resolve "Access Form Not Updating Table" Issue In Access 2010/ 2013/2016 database? If you are also the one who is dealing with this issue a lot then the solution is right here in this post. 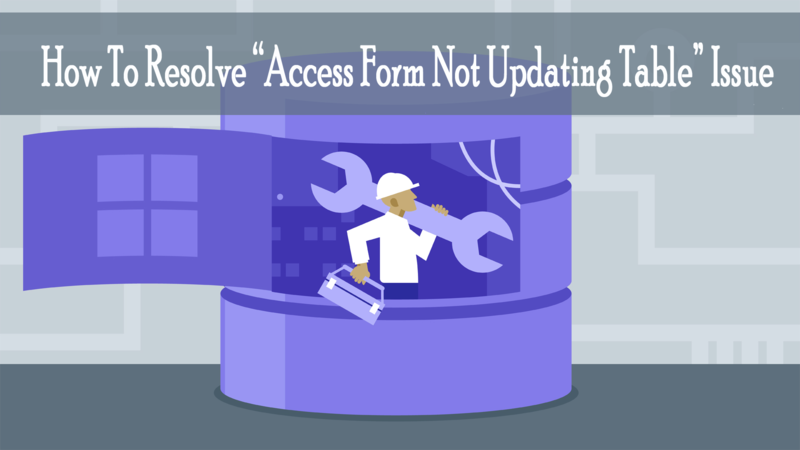 This post explains how to resolve the Access form not updating table issue. I have a fairly complex database with a main input menu. I update a field in the main input menu that is supposed to be linked to a table, it’s a company name. When I change the company name, it does not change in the table. I’m not sure why it isn’t updating, can anyone help me? Table: Whereas, a table is where data gets stored and table lives within a database. So without database there can’t be any table. Tables are a grid made up of rows and columns. Table Field Properties may affect the updating process. Or your Access form or table is somehow get corrupted. Below we will discuss on this main issue to resolve Access Form Not Updating Table issue. How Table Field Properties Affect Updating? If you are a newbie Access user or not very familiar with the concept behind relational database. Then until you can’t perform large updates successfully you can’t understand how properties set for table fields affect updating. At the time of designing a database, most of you typically use one or more tables at first. After then you decide which kind of data each table will contain, so you set primary key (a field that uniquely identifies each record) for each table and create the relationship among the tables. You need to set properties for the field in each table. Such as, you can assign Text Field to accept no more than 50 characters. You can set Number Field to accept only currency values. By using the design view you can set properties. However, you can set some properties using the commands in the groups on the Ribbon, part of the Microsoft Office Fluent user interface. Suppose that you can set visual formats for Text and memo field using commands in the Font group on the Home tab. How To Set Or Change The Properties For A Table Field? And secondly, you can open the table in Design View. Following here are steps on how to use both of the above mentioned techniques. From the navigation pane, make double tap over the table that you want to use. Tap to the datasheet tab and after then use the commands in the Data Type & Formatting group to view the properties for each field of the table. Just go to your navigation pane, and make a right click on the table after then tap to the design view. After this access will open the table in design grid. Under the field properties, hit the General tab, if it’s not already selected. To see the properties for lookup field, hit the Lookup tab. Lookup field is one such table field that uses either a hard-coded list of values or query which help in easy extraction of data from one or more table in the database. By default, lookup field present those values in list form. Depending on how database designer sets the lookup field, you can select one or more item from that list. Lookup field many times confuses the new access users because list of items appears in one location but data can be placed in another location. So it’s important to remember one that while you are updating a lookup field, you need to update the source table. As, you can’t update a lookup field from the list. Form will directly get saved to a table if that table is chosen as record source for the form. Doing, this allows the controls to be linked to the fields in the table. Check out the form properties to make sure that the table in which you are saving the data must be a source. Also check each control to ensure it is linked to the field where you want to save it in the table. How To Fix “Access Form Not Saving Records” Issue ? Access Form Not Updating Table can also be caused because of the corruption issue encountered in access form. So, besides trying off the following the above mentioned method you must try the access repair n recovery software solution. As this tool efficiently repair corrupt or damaged mdb or accdb files. It comes with powerful algorithm that scans even severely corrupted access database files. It also has highly interactive GUI that helps user to easily operate and repair Access database without making changes in the original structure of the file. It easily restores damage or corrupt tables, queries, indexes and other data. This tool can easily fix all minor and major database errors and problems of MS Access 2013, 2010, 2007, 2003, 2002, 2000 on almost all version of Windows operating system such as Windows 8/7/Vista/XP/2003. Free trial version is available that you can install to check the features and reliability of the software. Using this tool, you would be able to repair the access database easily with few mouse clicks. Restore form, queries, tables, indexes, and relations. Repair corrupt ACCDB or MDB database files. Supports Linked tables and calculated data type. It also supports calculated data or linked table. Recover password protected modules and forms and many more. MS Access provides numerous tools for updating existing records, including datasheets, forms, queries, and the option of find-and-replace. Before proceeding further, remember one thing that updating data is not same as entering new data. Try any of the above mentioned fixes to resolve Access Form Not Updating Table issue. But if you encounter any other issue then do share your experiences with us in our comment section. ← How To Unsplit MS Access Database?